Heritage Research on iTunes U. Preview and download video podcasts and learn about the history and heritage of previously unmarked or underrepresented communities with stories of local/national/global significance to the general public. 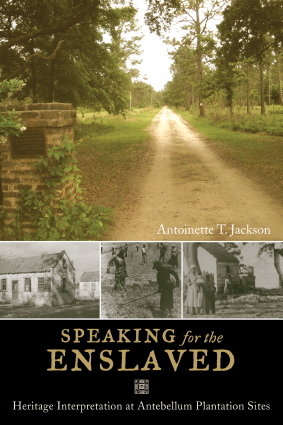 June 2012 Speaking for the Enslaved: Heritage Interpretation at Antebellum Plantation Sites. Walnut Creek, CA:Left Coast Press, Inc.
ABSTRACT: Focusing on the agency of enslaved Africans and their descendants in the South, this work argues for the systematic unveiling and recovery of subjugated knowledge, histories, and cultural practices of those traditionally silenced and overlooked by national heritage projects and national public memories. Jackson uses both ethnographic and ethnohistorical data to show their own heritage and cultural formations. Viewed through the lens of four distinctive plantation sites – including the one on which that the ancestors of First Lady Michelle Obama lived-everyday acts of living, learning, and surviving profoundly challenge the way American heritage has been constructed and represented. A fascinating, critical view of the ways culture, history, social policy, and identity influence sites and the business of heritage research management in public spaces. 2011 Shattering Slave Life Portrayals: Uncovering Subjugated Knowledge in U.S. Plantation Sites in South Carolina and Florida. American Anthropologist. Volume 113, Issue 3, pages 446-462. ABSTRACT There is an ongoing dialogue about slavery that is moored to ideological, social, and physical remnants of plantations. Scholars are active participants in creating and interpreting representations of postbellum plantations as public heritage sites that shape national memory. What tools and theoretical approaches can inform how we interpret, analyze, and represent characterizations of plantation life today? In this article, I talk about the historical moment in which plantations existed (transatlantic slavery), descendent interpretations, and ways in which descendent memories instruct reconfiguration of systems of categorization today. Research conducted in the three postbellum plantation communities in the U.S. South that are referenced in this analysis—Boone Hall and Snee Farm in South Carolina and Kingsley Plantation in Florida—inform this discussion. 2008 Imagining Jehossee Island Rice Plantation Today. International Journal of Heritage Studies. Volume 14, Issue 2, pages 131-155. ABSTRACT The analysis of the legacy of commercial rice production on Jehossee Island, today part of the ACE Basin National Wildlife Refuge, provides a unique opportunity to underscore the complex system of interdependence between Africans and Europeans in America. The dominant analysis and public discourse concerning antebellum plantations as national heritage sites, however, provides one perspective—primarily focusing exclusively on life as experienced by plantation owners and their families. In such interpretations, majority African communities go unrepresented. This article breaks new ground in giving primacy to the labour, ingenuity, and expertise of enslaved African people and the role they played in construction and preservation of an ecosystem considered to be of world class significance today.